Father Ned Blick admits there was a friendly competition with his parochial vicar, Father Michael Brungardt, to see which of St. Margaret Mary Parish’s priests could sign up the most adorers for their new Eucharistic adoration chapel. Although Father Blick, the pastor, offered “incentives” during the competition, in the end, the parish was the real winner: 400 adorers signed up to cover the 70 hours the adoration chapel will be open each week. Bishop Carl A. Kemme blessed the chapel Tuesday afternoon, March 19. Standing on the front porch of the former rectory just south of the church, he told nearly 100 attending the event that they were participating in a powerful moment. He praised the pastor, Father Blick, the parochial vicar, Father Brungardt, the former pastor, Father Eric Weldon, and all the others involved with the establishing of the adoration chapel. The chapel’s genesis, in part, is the result of prayer at another adoration chapel. Ana Trujillo was praying at St. Patrick Parish’s chapel in Wichita a couple of years ago when she received an inspiration to propose that St. Margaret Mary Parish, where she is the parish secretary, establish an adoration chapel. The former pastor, Father Weldon, supported Trujillo’s idea but was transferred before her inspiration could become reality. 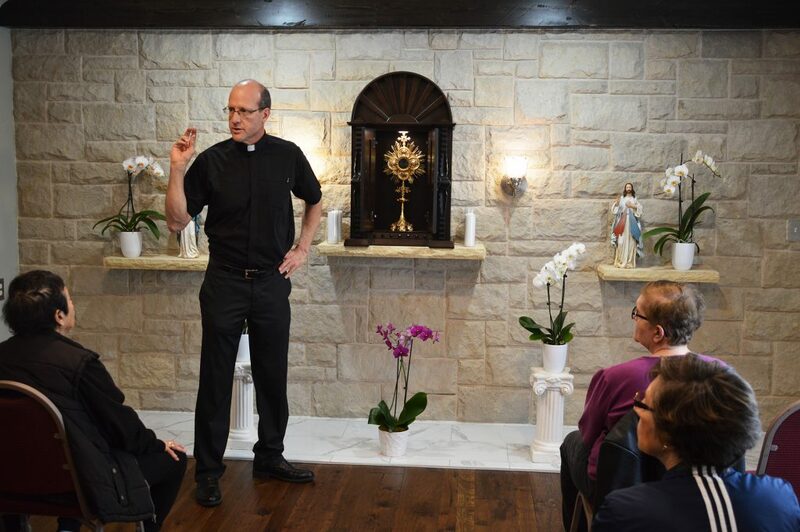 A series of events – including the assignment of an additional priest for the parish and the availability of a house big enough for two priests – meant the parish could renovate one of the rooms in the former rectory into an adoration chapel. After Easter, there is a tendency to fall back into pre-Lenten patterns he said, but we are always in need of Jesus, that constant source of strength that prayer provides. Father Brungardt said he first heard the call to the priesthood while in adoration at a Totus Tuus summer camp. He nurtured that call while at Benedictine College in Atchison, Kansas, and the day after Divine Mercy Sunday, after a two-hour stint in front of the Blessed Sacrament, he embraced that call and contacted the Diocese of Wichita’s vocation director to begin the process of transferring to a seminary. God isn’t calling all of the young men of the parish to the priesthood, but he is calling some of them, he said. Citing the dedication of his father and sisters to their adoration commitments, Fr. Brungardt said those who aren’t being called to the priesthood or religious life are being called to holiness. It is within Jesus’ heart that she could experience the joy her heart was truly in search of, he said, adding that she knew that in the Eucharist, in the monstrance, was everything.